Legends is a very large set. For one, it is larger than Beta. 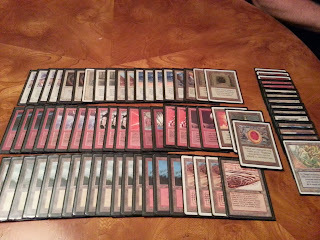 It is also larger than the three other legal expansions in 93/94 combined (Arabian Nights, Antiquities, and The Dark). There is a handful of very powerful cards in the set; like Mana Drain, Mirror Universe and The Abyss, but there's also a vast amount of sub-par cards in there. Lets dive into some of the more infamous parts of Legends. Christmas coming up! 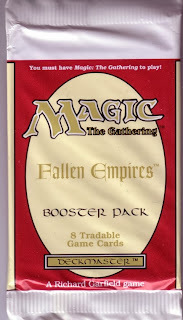 This week we'll take a quick look at a sweet deck in the seasons colors. There are two main approaches to Tax Edge we've seen a the top tables thus far. One is pretty much just an extension of traditional White Weenie, with some Plateaus and a mountain added to support Land's Edge and Lightning Bolt. 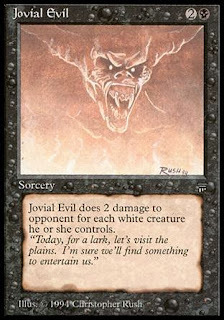 The other approach is creatureless, and uses cards like Ivory Tower and full sets of Howling Mine. Two topics about legality have been discussed vividly since the format started 2007. One was regarding Chaos Orb, and how we could legalize it while both maintaining the flavor of the card and avoiding messy play areas with spread out cards. The other one is regarding the legality of Fallen Empires. The issue with Chaos Orb was solved about two years ago, and we haven't looked back. 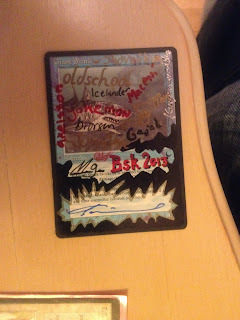 The topic with Fallen Empires is still being discussed, and was brought up again during last BSK. It's easy for people to find things they don't approve of. Be it jazz music, Elvis's hips, horror films, or Dungeons and Dragons. One of the latest crazes about this have been violent video games. 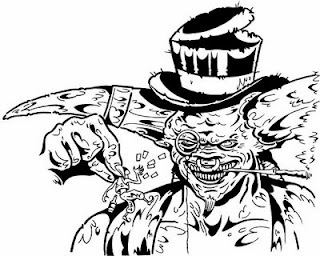 Before the GTA era however, Magic was seen as a dangerous influence by many of the more fundamental groups. 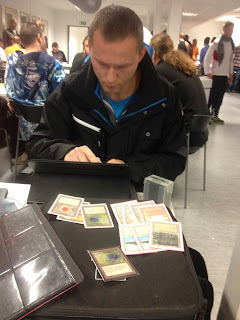 As last weekend's tech session in Gothenburg didn't pan out, I'll instead write a little about the dangers of playing Magic. Beware! 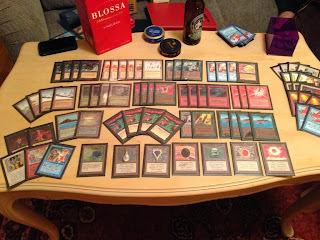 Anyway, as I didn't do any brainstorming at the bus (I think this weeks topic were supposed to be about Goblin decks), I will "wing" this post with something completely different, and write about a topic that comes up quite a lot while discussing the Old School format; the name 93/94. People often ask why we don't allow Revised or Fallen Empires, and I'll try to answer this as good as I can. 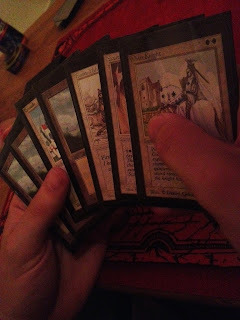 About 18 years ago, I remember a guy at TV-spelsbörsen pointing at a card on their "Wall of Magic". 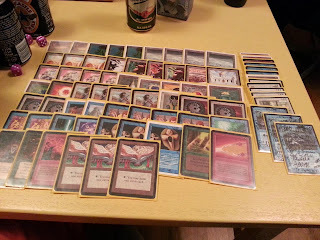 Tv-spelsbörsen was one of the local gaming stores in Gothenburg in the 90's, and one of the walls in the store was completely covered in color proxies of every magic card ever printed at that point. 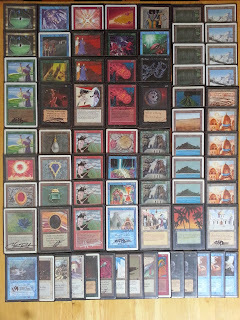 I remember many days staring at the wall and trying to learn all the cards. 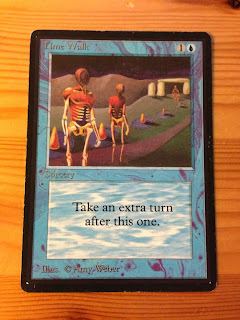 I still didn't really know which cards were good, but I do remember this guy talking to a friend of his, and pointing at Time Walk, stating that it was the best Magic card ever printed. I knew he probably had a point, but I didn't really understand why. It felt like Polar Kraken would be a superior win condition.